Among the wealth of advice that Reinhardt, the German who has been driving cars to Africa to sell for years, gave me was to acquire my visa for Guinea-Bissau at its consulate in Ziguinchor, Senegal twelve miles north of the border, rather than at its embassy in The Gambia. He said it would be quicker and cheaper. I was beginning to wish though that I had gotten it over with while I was in The Gambia as I struggled to find the consulate. The first person I asked, a motorcycle taxi driver, sent me a mile-and-a-half down the road, either not understanding my question or simply being ill-informed. The next person I asked knew its general vicinity back from where I had come and even volunteered to drive me there, but not knowing how long it would take to get the visa, I didn't care to keep him waiting to take me back to my bike. As I've experienced all too often here, my search for the consulate turned into a most aggravating ordeal, as I had to ask another half dozen people, who all headed me in the general direction of the consulate without knowing its precise location. I could have easily tracked down The Guinea-Bissau embassy in The Gambia, as it was marked on my GPS device,and if I had, by the time I finally found the consulate in Ziguinchor, I would have already crossed the border into Guinea-Bissau. Anyway, once I found the small consulate off on a side dirt road, it was an easy matter of getting the visa and all was well. At least the border crossing was accomplished with a minimum of fuss, just as I managed leaving The Gambia the day before returning to Senegal for a brief spell. My passport is filling with Sengal entry and exit stamps and I have two more to come. It was even an easy matter of changing my remaining dilisas to CFAs, which was also the currency of Guinea-Bissau, as it had been in Senegal and Mali. 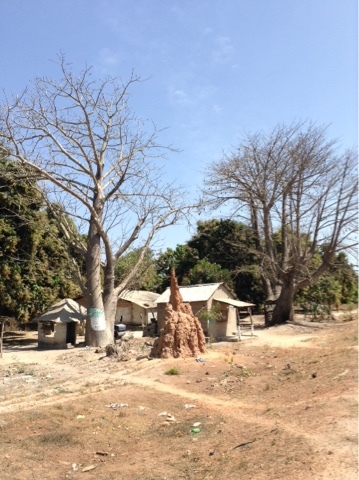 Crossing into the souther segment of Senegal, known as Casamance, was like crossing into another country with its lush, tropical vegetation, a stark contrast to the semi-desert of the rest of the country, one of the reasons there is a separatist movement there that at times has resorted to violence. It has presently calmed down, but there is enough of a residue of the rebel mentality for one to be wary of banditry. Reinhardt advised that I be careful about camping, so when I came upon a campement, rustic accommodations catering to locals, outside a small town, I decided to take advantage of it even though more than an hour of light remained. They don't necessarily provide camping, but this one allowed me to set up my tent under a very shady mango tree after considerable raking to clear a flat spot, not having had anyone camp there in quite a spell. The preferred stay is in one of three large oval huts divided into four or five rooms each with toilets and showers in another hut. It was perfect for me, though there was no electricity until after dark and the mosquitoes were pesky enough to find their way into my tent. I had to arise a couple of times during the night and turn on my headlamp and go on a killing spree to eliminate the few who had penetrated my defenses. It is staggering how loud a buzz such a slight wisp of protoplasm can make. When I camp in the bush away from human contact the mosquitoes have not been an issue. They weren't a particulate nuisance at the Sukuta campground, but after dark a mosquito or two would make its presence known. 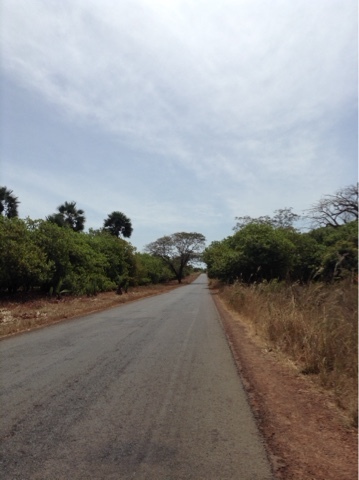 The vegetation became even more tropical in Guinea-Bissau with palm trees along the road and orchards of mango and apple trees. The lightly traveled road to the capital was narrow and unlined, like a secondary road, with patches of potholes when the road dipped to pass through dry river beds that would overflow during the rainy season. Signs were in Portuguese, as Guinea-Bissau is one of two countries in West Africa that were colonized by Portugal, the other the Cape Verde Islands. People along the road well know it is unlikely visitors speak Portuguese so they would great me with "Hello" followed by "ca va?" combining English and French. The small villages seemed no different than any others I had been passing through the past month. There would be small tables with a handful of oranges or tomatoes for sale and with luck bananas or flour balls. No ice balls though. Guinea-Bissau, along with Mali and The Gambia, is among the twenty poorest countries in the world. West Africa is the poorest region in the world with nine of its eighteen countries in that bottom twenty. It is obvious from the minimal offerings and basic, somewhat primitive, dwellings, that these people are just scraping by, leading simple lives that might be termed lives of deprivation. Since they do have a sense of the rest of the world out there, they surely understand they don't have as much as most. How they accept this, someone such as me just passing through wouldn't know. If their underlying attitude is reflected by the children who ask for money, they can't be fully accepting of their lot. 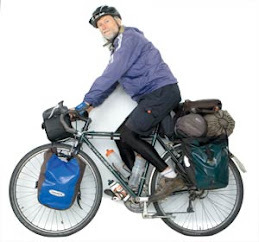 I frequently recall the comment of a Kenyan when I biked around Lake Victoria a few years ago. When it took me two trips to haul all my gear from my second floor hotel room, after my second load he said, "You white people are given so much." I thought I might spend a day hanging out in Bissau, the capital of Guinea-Bissau, but it had no allure, not even its ocean front and port. It could be the world"s most run-down, bedraggled capital. Most of the side streets, even those leading to the port, are dirt and rocky, most treacherous to bike. At least there's not much traffic. The old colonial buildings all look like they could collapse if there was a shudder of an earthquake. 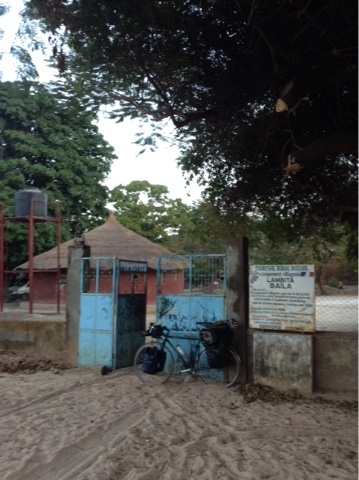 I was the only guest at Lonely Planet's endorsed pension, just as I had been in Dakar. West Africa is not much of a draw. Sounds like a grim place George, especially when you consider that these dirt poor countries were once controlled by Europeans. It's shameful that they didn't elevate the population out of the dirt. George, did you happen to get a picture or two of the colonial buildings you describe? You may remember, I'm the one who always wonders what your campsites look like. Safe travels, friend! Bill: Bissau was so lackluster, I had no urge to photograph it. Some of the balconies on the old buildings were eye-catching, but none demanded to be photographed. My pension was supposed to have wifi but after five hours of trying to connect, I gave up and took advantage of the wifi at one of the fancy hotels. One of th best things about the city was the lack of traffic. There was hardly any even on the final five mile stretch from the airport to the city center other than a few block stretch past the market.